ServicesFind out about the services that we offer. PracticesHow to find us. We look forward to your visit. Heart RhythmsInformation on what defines a normal heart rhythm and the most common types of arrhythmia (disorders of heart rhythm). ImagingInformation on what defines a normal heart rhythm and the most common types of arrhythmia (disorders of heart rhythm). ServiceVarious documents and links to interesting sources of information are provided here for patients and physicians. Information on what defines a normal heart rhythm and the most common types of arrhythmia (disorders of heart rhythm). The heart is the motor that keeps us alive. Each minute, it pumps almost five litres of blood through the body, supplying organs, tissue and cells with oxygen and nutrients. Normally our heart beats evenly and we don't think about it – ideally this should remain the case throughout our lives. Frequently, however, people notice the occasional beat out of place, or a “skipped” beat, or have palpitations. There are also symptoms that at first sight have nothing to do with the heart, including fatigue, shortness of breath, and feelings of anxiety, which can accompany arrhythmia disorders. This term encompasses a large number of disorders where the normal heart beat rhythm is disrupted as a result of various causal factors. Just as the way they present can vary greatly, so too can their significance for ongoing life differ – some are harmless, others are life-threatening and require urgent treatment. This is a decision that only your doctor can make. You can feel reassured in knowing that effective treatment options are available for practically all types of arrhythmia these days, and together, we’ll find the right one for you! Alongside your personal consultation, you can use this website to find out how the heart works, how arrhythmia can manifest itself, and how such disorders are diagnosed and treated. The heart is the motor that drives your blood circulation, contracting 60–100 times a minute to pump blood through your body. It has two atria and two ventricles through which the blood flow: All of the used blood is collected from around the entire body in the right atrium, the right ventricle pumps it into the lung, where it is revitalised and oxygenated. Then, the oxygenated blood collects in the left atrium and the left ventricle pumps it throughout the body. When we engage in physical effort or become mentally excited, our pulse can rise to over 160 beats a minute. In younger people, in sportspeople or under the influence of medication (e.g. beta-blockers), our pulse at rest can fall below 60 beats a minute. Each heart beat is triggered by a small electrical impulse that passes through the heart from top to bottom and causes the cells of the myocardium, the heart’s muscle, to contract. This pulse is generated by the heart itself in the sinus node (normal heart rhythm = sinus rhythm). 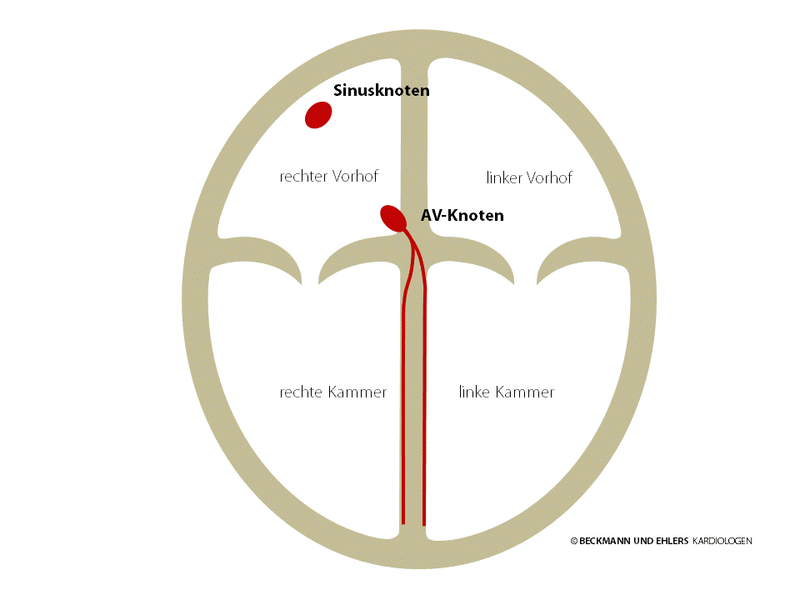 From there, it passes through the heart’s atria to the AV node. 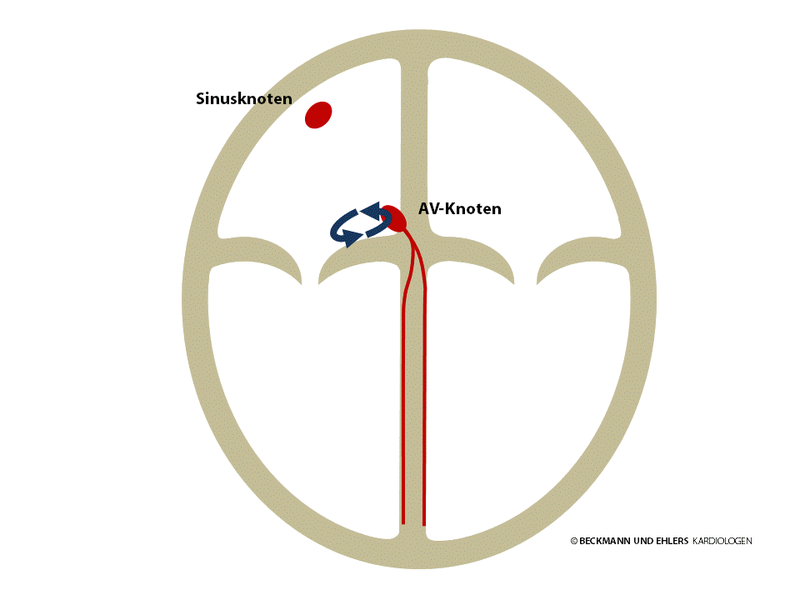 The AV node is normally the sole electrical pathway between the atria and the ventricles. It conducts the electrical impulse onwards to the ventricles, enabling the pulse to spread out through the ventricles. A slow heart rate (pulse under 60 beats a minute) is referred to as bradycardia. Bradycardia is not always indicative of a disorder – in young people and very fit people in particular, a resting pulse of under 60/min is nothing unusual. Certain medicines such as beta-blockers can also slow the heart rate. The patient’s symptoms dictate whether bradycardia needs to be treated, which is why you should always discuss this with your doctor. This also applies if breaks occur in your pulse. If you suffer from dizziness and fainting as a result of such arrhythmia disorders, pacemaker therapy provides you with an extraordinarily effective method of treatment. A fast heart rate (pulse over 100 beats a minute) is referred to as tachycardia. Again, tachycardia is not always indicative of a disorder – faster heartbeats are entirely normal when we get excited or engage in strenuous physical activity. But there are states of tachycardia that are caused by abnormalities in the heart’s natural pacemaker, the sinus node. The most common forms of tachycardia are: Atrial fibrillation, atrial flutter, AV nodal re-entry tachycardia, WPW syndrome, atrial tachycardia, ventricular tachycardia and ventricular flutter. These will be described in more detail in the following sections. Atrial fibrillation is the most common form of arrhythmia, and means that the electrical stimulation of the atria no longer comes from the sinus node. Instead, there is a jumble of different electrical impulses passing chaotically through the two atria. As a result, the atria can no longer contract in an orderly fashion, and their pumping capacity suffers. This loss, which can account for up to 20% of the heart’s total performance, may be noticed by you in the form of diminished performance. Because there is no organised stimulation of the atria, the AV node is also unable to pass electrical impulses to the ventricles regularly, causing an irregular pulse, which is known as absolute arrhythmia. Many patients experience discomfort with irregular heartbeats, and this problem often impairs their quality of life considerably. How quickly the pulse stumbles is solely dependent on the conductivity of the AV node. Thankfully, the ventricles are protected from the electrical chaos in the atria thanks to the filtering effect that the AV node provides. The faster the heart beats, however, the more pronounced the discomfort. The lack of contraction of the atria can cause the blood flow to stop in certain areas of the atria. This is particularly the case with the atrial appendage, where a clot or “thrombus” can easily form. 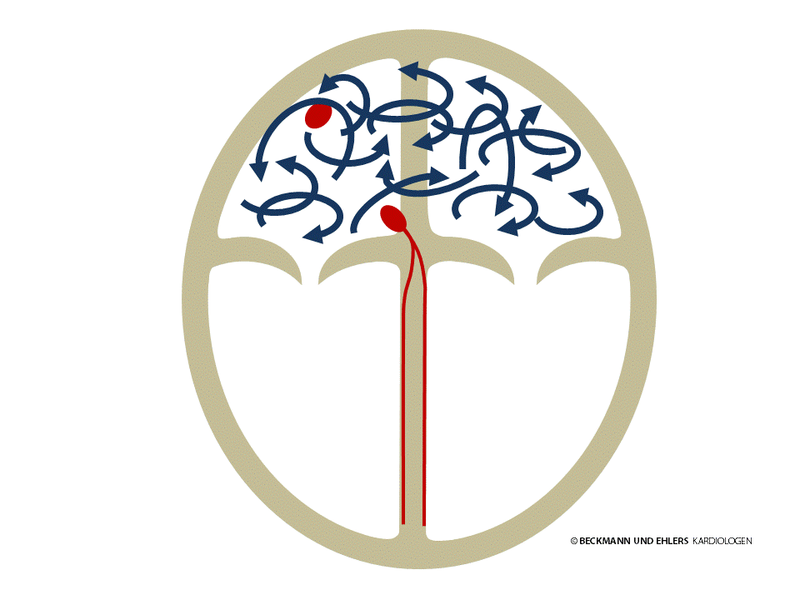 If it is carried by the blood flow, this presents the risk of a stroke. Atrial fibrillation can occur in the form of attacks (“paroxysmal”) which disappear of their own accord. Persistent atrial fibrillation occurs when the atrial fibrillation does not stop of its own accord, but rather needs to be stopped by the doctor (e.g. by electrical cardioversion). Finally, chronic (“permanent”) atrial fibrillation persists permanently without further attempts to restore the normal heart rhythm being undertaken. All forms of atrial fibrillation can cause symptoms such as palpitations, shortness of breath, dizziness and reduced performance, which is why it should always be treated. The aim of this treatment is not to avoid atrial fibrillation, but instead to prevent excessively fast beats of the heart during atrial fibrillation. Medication is therefore administered that intensifies the filtering effect of the AV node (e.g. beta-blockers, verapamil, digitalis). The aim of this therapy is to prevent atrial fibrillation, for which special arrhythmia medications are available, known as anti-arrhythmics (e.g. flecainide, propafenone, amiodarone). These medicines may only be administered under careful supervision. Unfortunately, several studies have indicated that their effect is often limited. If episodes of atrial fibrillation do not end of their own accord, your heart can be “reset” to its natural rhythm by way of electric shock, for which a brief anaesthetic is necessary. However, this method does not have a long-term stabilising effect on the heart’s rhythm. Pulmonary vein isolation is a modern therapy for the prevention of atrial fibrillation that has developed into a routine treatment for atrial fibrillation in recent years. Professional cardiology associations have increasingly been recommending the early use of this treatment. Atrial fibrillation refers to the atria of the heart beating very quickly and irregularly, which can cause symptoms such as palpitations, shortness of breath, dizziness and reduced performance. This form of arrhythmia occurs only briefly or in an attack-like fashion in some patients, while atrial fibrillation in others is persistent. It is now known that such attack-like atrial fibrillation is triggered by rapid extra beats from the pulmonary veins. Patients sometimes sense these extra beats as a brief “stumble” of the heart or a skipped beat, which can result in the actual fibrillation. Atrial fibrillation used to be treated using medication with the aim of relieving the symptoms. However, such drug therapy was not effective in many patients, or they had an intolerance towards anti-arrhythmic drugs. Today, catheter ablation is a modern and effective alternative. Because it is much more effective for and tolerated much better by many patients than years of drug therapy, it should be considered as an option early on and discussed with your doctor. What does catheter ablation mean in relation to atrial fibrillation and pulmonary vein isolation? Catheter ablation involves a special catheter, which is a thin metal wire with a plastic sheath, being fed into the inside of the heart. Metal electrodes at the tip of the catheter are brought into contact with the heart tissue that is responsible for the arrhythmia. High-frequency alternating current is used to briefly heat the tissue to around 50°C and cauterise it. 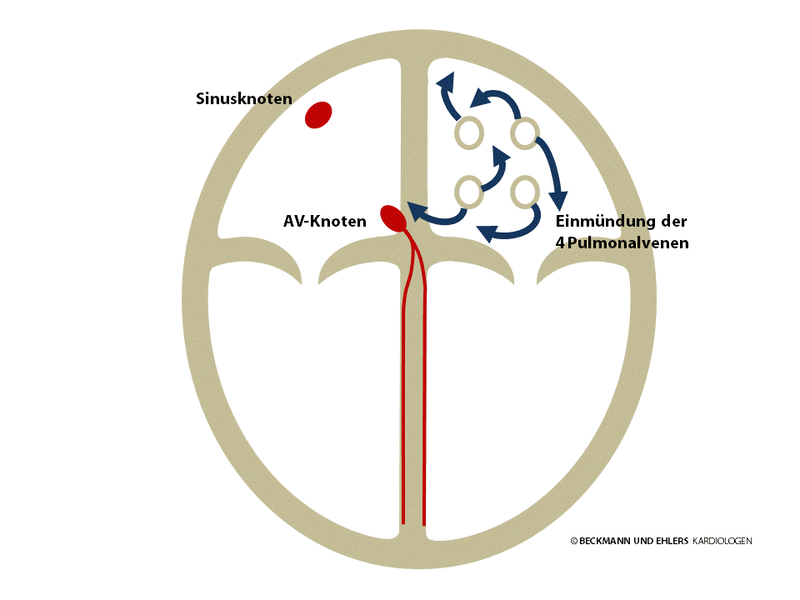 The creation of ablation lines helps to electrically isolate the pulmonary veins from the left atrium. This prevents quick extra beats from the pulmonary veins reaching the left atrium and triggering atrial fibrillation. 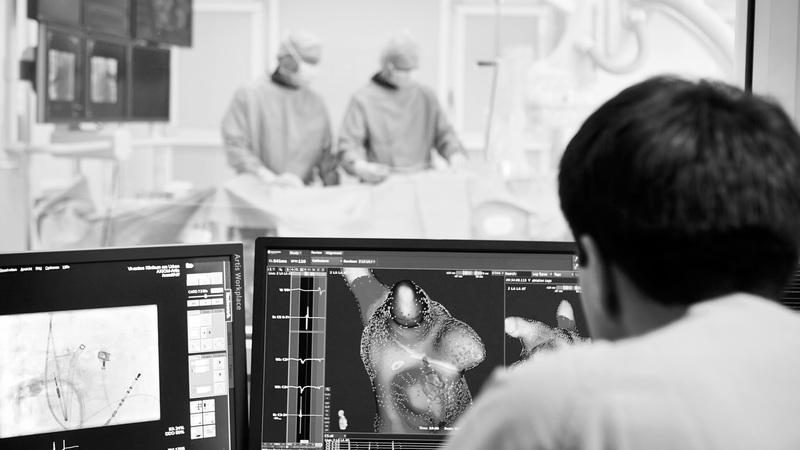 Catheter ablation is a technically complex procedure that is performed with the aid of three-dimensional “mapping systems”. Alongside treatments that involve heating using high-frequency alternating current, there are also procedures that involve cold (“cryoablation”) and laser energy (“laser balloon ablation”). Pulmonary vein isolation: What happens during the stay at the clinic? Of course, you will feel a degree of uncertainty about such a procedure. The best remedy against this in our opinion is to find out exactly what you can expect. To this end we will go through the therapy step by step with you. In addition to this, you can also read here how the procedure is performed. Before treatment in the electrophysiological cardiac catheter laboratory, you will be thoroughly examined, which includes an ECG, an ultrasound of the heart from outside and through the oesophagus (the “TOE”), and a blood test. You must be nil-by-mouth on the day of the examination, so from midnight of the previous day, please only consume liquids. During the examination, you will be administered both sleep-inducing and anti-coagulant drugs intravenously. After local anaesthetic is administered, thin plastic hoses – the sheaths – are placed in blood vessels to enable the catheter to be fed into the heart. 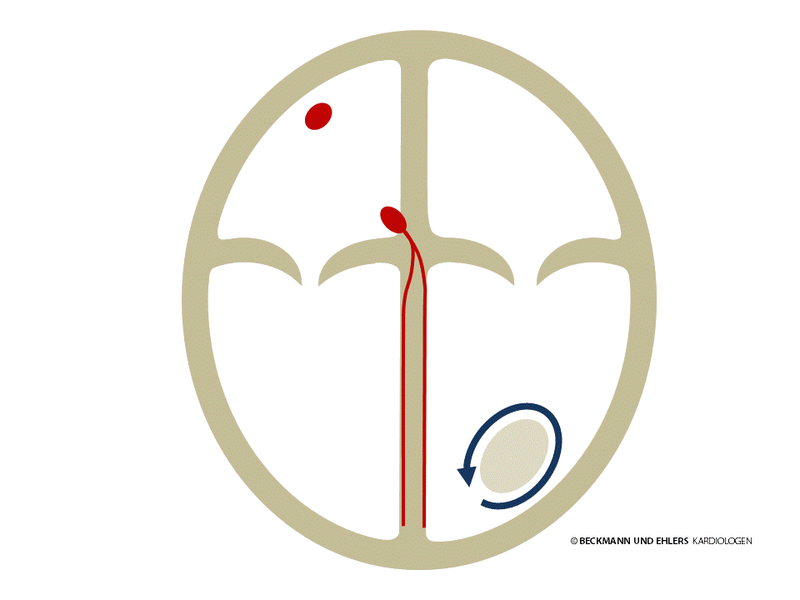 To preserve access to your left atrium and the pulmonary veins, a fine needle is used to penetrate the septum between the right and left atria. Special catheters are then positioned inside the pulmonary veins to identify the triggers of the atrial fibrillation. A contrast dye injection is used to highlight the transitions between the pulmonary veins and left atrium on the x-ray. A 3D reconstruction of your left atrium and the exit points of the pulmonary veins are then generated on a computer. The ablation catheter is then used to create an isolation line around two pulmonary veins each by means of several cauterisations. Because each pulmonary vein can in principle be the point of origin of superfluous beats, all of the existing pulmonary veins are isolated, one after the other. All of the catheters are then removed from your heart. When you awaken, you will be moved in your bed to the monitoring station where you will be carefully looked after. To prevent further bleeding around the puncture area, you must maintain absolute bed rest for several hours. The following side effects can occur in exceptional cases. You will be extensively informed about these and their treatment in the prior consultation with your doctor. Pulmonary vein isolation – what now? Once discharged, you will receive ongoing care in our consultations for patients with arrhythmia disorders, during which any necessary follow-up examinations will be performed or coordinated. Should additional drug therapy be necessary, the doctors will discuss this with you. Blood thinners will certainly be necessary for several months (even if you did not need to take such medication beforehand). Any existing treatment with blood thinners will always be continued. If atrial fibrillation occurs again after the so-called “blanking time”, an electrophysiological test is usually recommended. Here, the possibility that the pulmonary veins may have recovered their conductivity is tested by means of a repeated examination using a heart catheter. During this follow-up examination, it is then possible to finish off incomplete ablation lines. Many people suffering from atrial fibrillation are at greater risk of stroke. Patients in particular with additional diseases such as heart failure, high blood pressure and diabetes, as well as older people, must undergo careful examination to determine whether treatment with blood thinners needs to be administered. Patients who have already suffered a stroke are at particularly high risk. This treatment was usually performed using Vitamin K- and argonists until some years ago. Careful monitoring with regular blood tests is necessary with this treatment (INR or Quick value testing). New substances, known as direct anti-coagulants, no longer need to be monitored by means of blood tests. We will discuss with you which form of blood thinning therapy is best suited to you. The closure of the appendage, or auricle has developed into an alternative treatment in recent years. This technique is based on the knowledge that clots caused by atrial fibrillation usually develop in the appendage of the left atrium. This appendage can be sealed using a plug known as an occluder. This makes blood thinners unnecessary, but the benefits of such treatment have only been scientifically proven for a small number of patients at this time. Atrial flutter means that the atria are not stimulated by the sinus node. In its typical form, the electrical impulse instead follows a circuit in the right atrium, circulating up to 300 times a minute. Thankfully, the AV node does not usually allow the impulse to pass through to the ventricles in each circulation. However, it is not uncommon for the impulse to pass through to the ventricles in every other circulation, in which case palpitations occur with a heart rate of around 150 per minute. Atrial flutter cannot be adequately treated with medication. The therapy of choice in this case is catheter ablation to permanently interrupt the circuit. The rate of success for this routine procedure is >95%. After the procedure, you will usually no longer need to take anti-arrhythmic drugs. 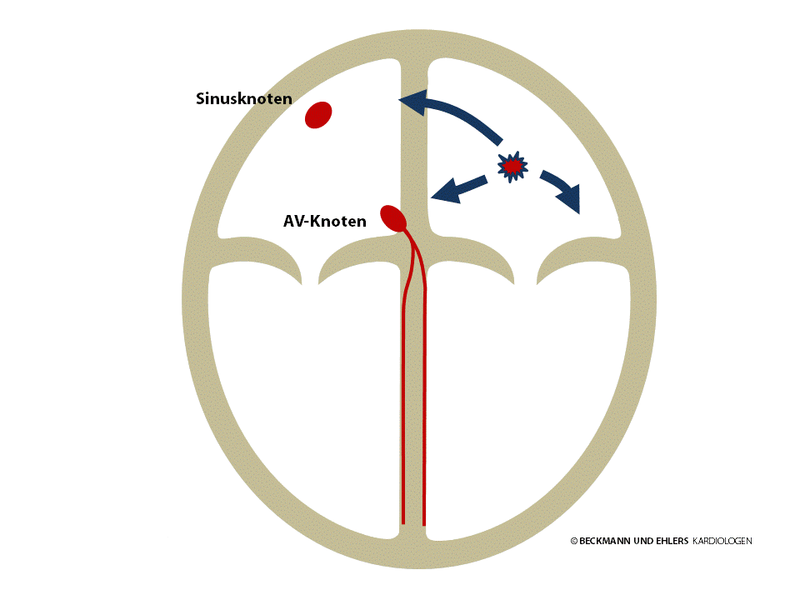 AV nodal re-entrant tachycardia occurs due to two electrical pathways being present near the AV node. 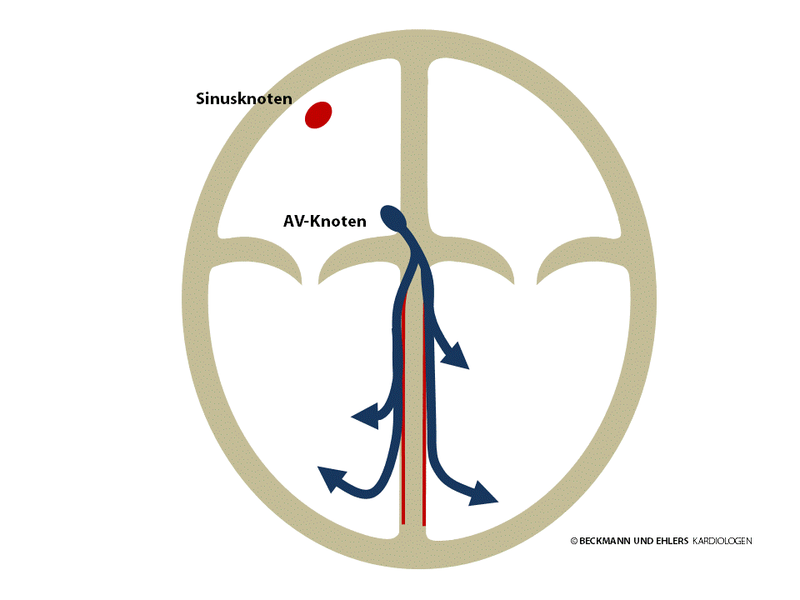 Under certain conditions, often triggered by an extra beat of the heart, the electrical impulse at the AV node begins to circulate and typically triggers a heart beat at each circulation. The palpitations that this causes are particularly unpleasant and frequently cause feelings of anxiety. AV nodal re-entrant tachycardia can therefore impair your quality of life considerably, but thankfully it is not dangerous. Medication has proven to be inadequately effective in treating it. The treatment of choice is catheter ablation to ablade one of the two electrical pathways situated near the AV node. The result is complete recovery. The success rate of this routine procedure is around 98%. 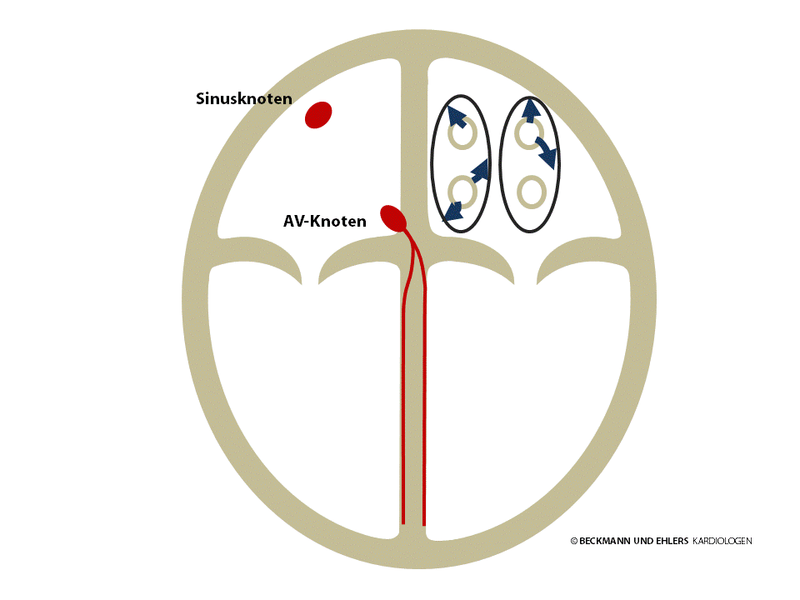 Normally, the AV node is the sole electrical pathway between the atria and the ventricles. However, some people have an additional congenital pathway known as the “bundle of Kent”. 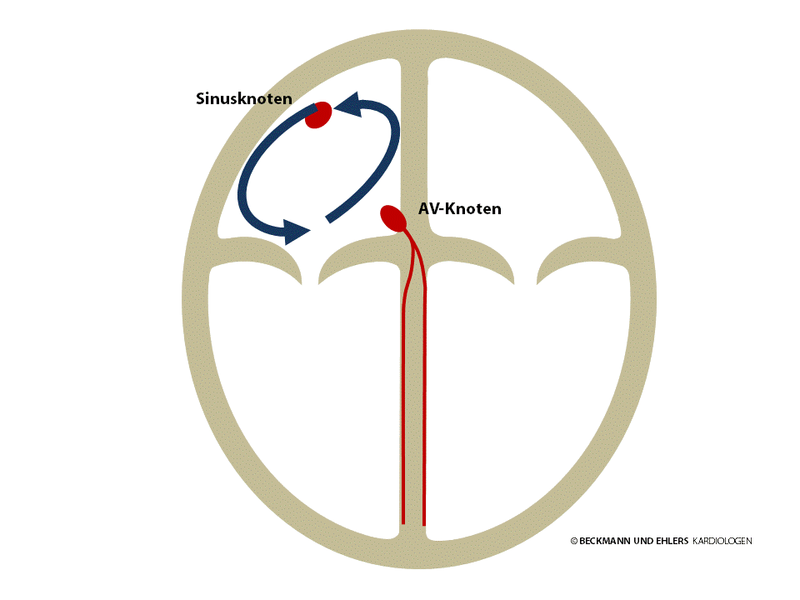 This pathway can circumvent the AV node to carry electrical impulses both from the atrium to the ventricle and, conversely, from the ventricle to the atrium. Often – but not always – this bundle can be detected in a normal ECG. Under certain conditions, usually triggered by extra beats of the heart, the electrical impulse begins to circulate, typically from the atria to the ventricles via the AV node and returns to the atria via this extra pathway, as if going through a back door. A heart beat is triggered with each circulation, and palpitations result. Particular attention must be paid to patients when atrial fibrillation occurs. 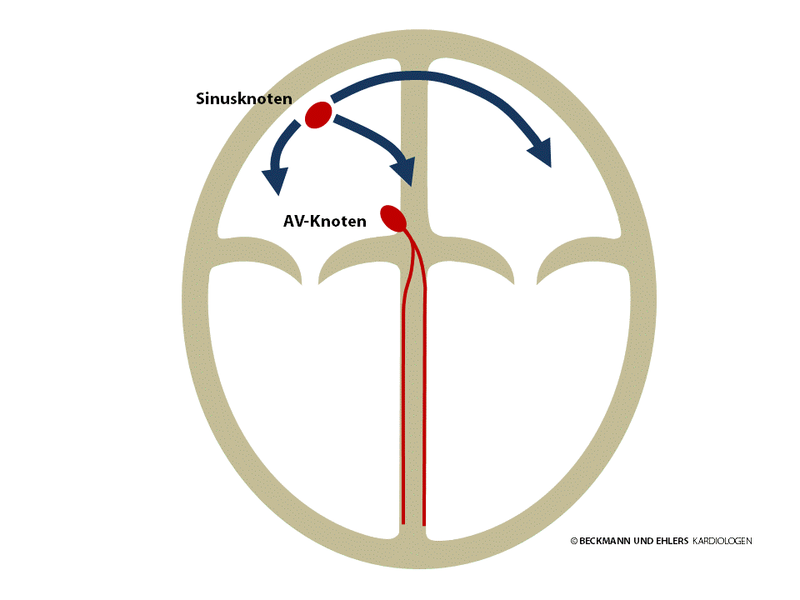 There is a risk here that the filtering effect provided by the AV node is circumvented, which would cause the electrical chaos to spread via the extra pathway from the atria to the ventricles. In worst-case scenarios, such a situation can give rise to life-threatening ventricular arrhythmia disorders (“ventricular fibrillation”, sudden cardiac death). Medication is not a reliable method of preventing electrical impulses from being conducted via this extra pathway, which is why catheter ablation of the additional bundle is the treatment of choice. The result is complete recovery. Depending on the location of the bundle, the success rate is between 95 and 99%. The administration of anti-arrhythmic drugs is no longer necessary after the procedure. Atrial tachycardia is caused by myocardial cells in the atrium generating electrical impulses in rapid succession in place of the sinus node. These impulses spread to the heart via the normal pathways and cause palpitations. In addition to drug therapy, the source of the disruption is successfully located during a special catheter examination and eliminated by way of catheter ablation in many cases today. The success rate is between 70 and 90%. Ventricular tachycardia is a serious arrhythmic disorder that occurs in the ventricles. It can severely impair the function of the heart and can be life threatening, especially in patients with heart disorders. A very careful examination of the heart is usually required to identify possible causes and administer appropriate treatment. In some cases, patients who otherwise have healthy hearts and benign ventricular tachycardia can be treated with only drug therapy or catheter ablation. Most patients, however, require the implantation of a cardioverter-defibrillator (ICD, Defi). This device monitors the heart rate and protects the wearer from life-threatening arrhythmia disorders, in particular “sudden cardiac death”. ICD patients who frequently require ventricular tachycardia to be treated by the ICD can also have ablation therapy (“VT ablation”) performed. Ventricular fibrillation is the most dangerous of all arrhythmia disorders. The ventricles are no longer stimulated in an orderly fashion by the electrical impulse sent via the AV node from the atria. Instead, there is total electrical chaos in the ventricles, and the heart ceases to pump. Ventricular fibrillation results in unconsciousness in just a few moments, and unless immediate aid is administered, will invariably result in death. The only possible treatment for ventricular fibrillation is electric shock therapy (“defibrillation”). Because the human brain will suffer irreparable damage after just a few minutes of ventricular fibrillation, aid must be administered as quickly as possible. Today, patients that are successfully resuscitated from ventricular fibrillation are fitted with a defibrillator implant that can protect the wearer from sudden cardiac death, unless a treatable cause can be found. For patients at high risk of a life-threatening arrhythmia disorder, a decision must be made whether to implant such a device by way of precaution. ECGs play a particular role in diagnosing arrhythmia disorders. There are many different types of arrhythmia disorders that can feel similar to patients, and it is only possible to differentiate between them using an ECG. The success of treatment is always dependent on the accuracy of the diagnosis. In addition to normal ECGs and 24-hour ECGs, ambulatory measurements lasting several day and ECG “event recorders” are also available. These enable you to easily record your own ECG. The ECG recorder implant, which enables ECG recordings of up to three years, is particularly suitable for rare and unpredictable arrhythmia disorders. Where possible, you should endeavour to have your arrhythmia recorded once on an ECG. To this end, it may be advisable to seek out the A&E of a hospital or your local GP in the event of an attack. If you already have an ECG recording of your arrhythmia, please bring it with you. Fainting attacks occur frequently. In many cases, the cause needs to be identified on the basis of the patient’s history and simple examinations. Unfortunately, the causes of fainting remain unclear in over one third of patients, but it is important to clarify the underlying cause, because fainting is a symptom that can be due as much to a harmless circulatory reaction as it can to an arrhythmia disorder that requires urgent treatment. With appropriate examinations and the use of state-of-the-art diagnostic techniques, we can clarify the cause for almost all patients and develop specific therapy strategies for them. Electrophysiology is a special field of cardiology that addresses the diagnosis and treatment of arrhythmia. It is not always possible to identify the causes of arrhythmia from outside in a normal ECG. In such cases, a recording of the electrical currents from the inside of the heart can provide key indications for the correct diagnosis. With many types of arrhythmia, there is also the opportunity for full recovery through elimination of the underlying problem. This is why, in “interventional electrophysiology”, the precise cause of your arrhythmia is determined during a heart catheter examination, and if possible, eliminated right there. What is the purpose of the examinationg? 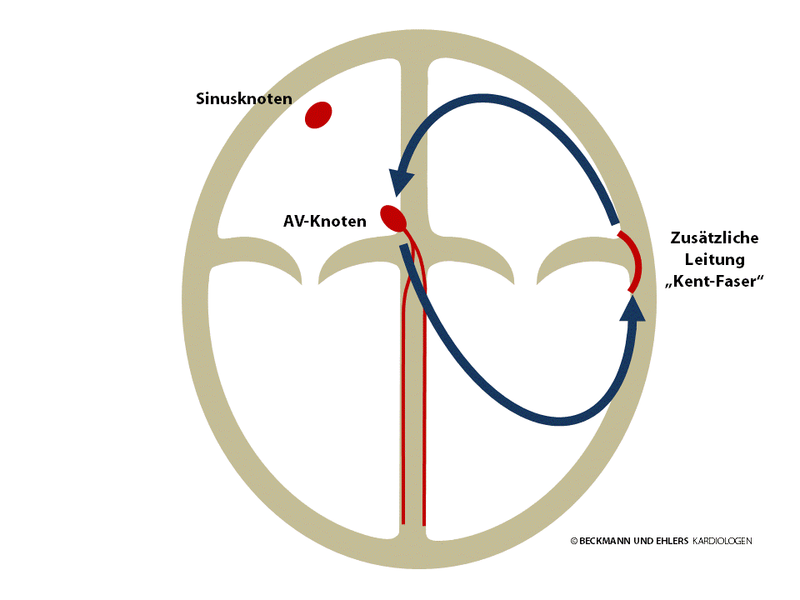 The aim of the electrophysiological examination is to determine the precise cause of your arrhythmia. 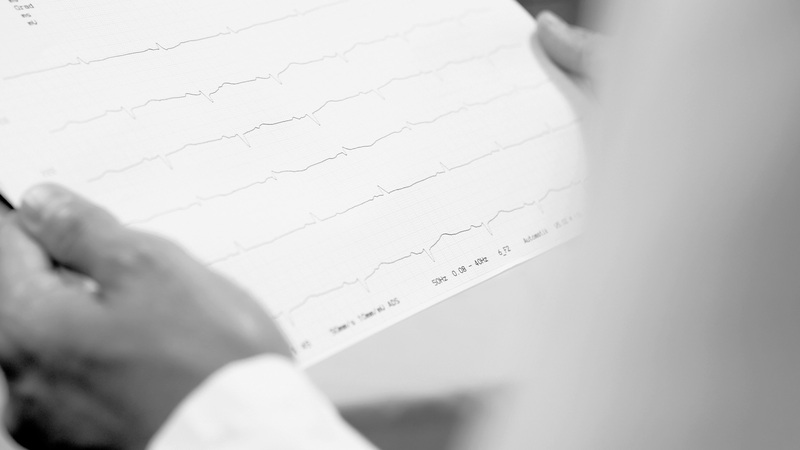 For certain heart disorders or irregularities in the (on-the-spot or ambulatory) ECG, we can also estimate the risk for the reoccurrence of arrhythmia disorders. Catheter ablation involves the cauterisation of the area of your heart responsible for the arrhythmia in order to disable it. This enables many patients to be healed fully at the source of the problem. Preparation includes preliminary examinations such as an ECG at rest, an ultrasound scan of the heart, a blood test and in particular a detailed discussion with your doctor. You will be admitted on the agreed date. During the procedure, you will be connected to various devices (e.g. ECG, blood pressure gauge, respiratory monitor) for the continuous monitoring of your heart’s and circulation’s function. The examination will be performed in most cases under mild sedation, meaning that you will be administrated sedatives. Especially during ablation for the treatment of atrial fibrillation (“pulmonary vein isolation”), but also if requested for other procedures, medication will be administered to induce a deep sleep. The electrophysiological heart catheter (a thin, flexible probe) is used to ascertain the cause of your arrhythmia. Where possible, cauterisation of the source of the problem is performed directly (“catheter ablation”). After the procedure, several hours of bed rest are required. If necessary, your heart’s rhythm will be monitored for some time in the observation ward. You will ordinarily be discharged from the clinic on the first or second day after the procedure. You will receive a detailed examination report with all of the information needed for further treatment. Once discharged from the clinic, you should avoid strenuous physical activities for a week. 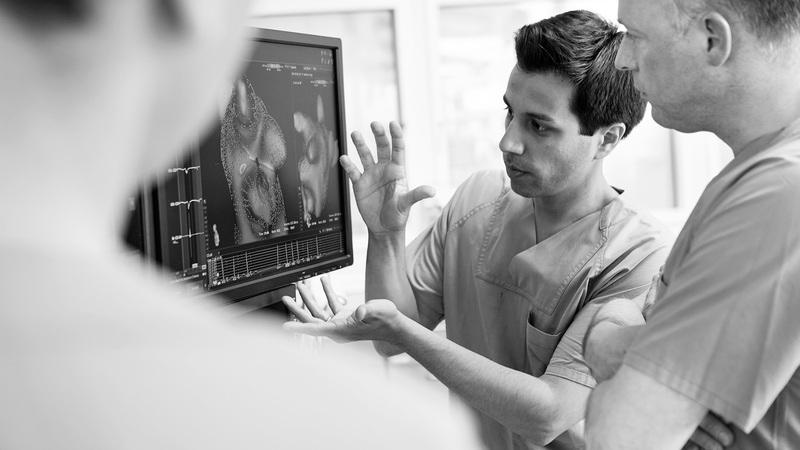 In the follow-up consultation, the results of the electrophysiological examination/catheter ablation and any further action may be discussed with you if necessary. 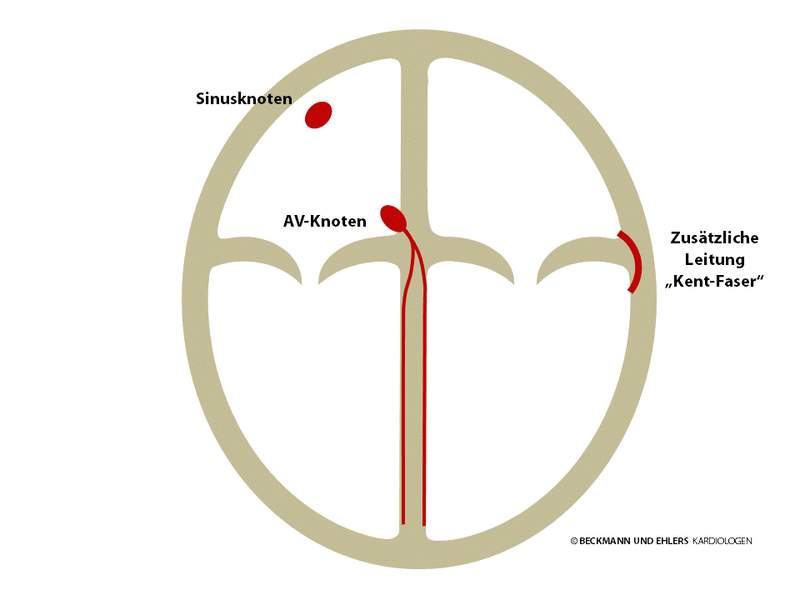 Further information on the electrophysiological examination and catheter ablation can be found on the website of our partner „Netzwerk Rhythmologie“. Before any treatment, the arrhythmia is precisely diagnosed, as this is the only way that we weigh up the benefits and potential risks to select the best treatment for you. Although treatment of arrhythmia using heart catheters (“catheter ablation”) has advanced considerably in recent years, this procedure is unfortunately still not equally well-suited to all disorders, which is why drug therapy continues to play an important role. If the choice is made to treat your arrhythmia with drug therapy, there are likely to be several medications available. We will discuss with you in detail which of these medicines is suitable for you – whether singularly or a combination. The implantation of a pacemaker is the most effective treatment for symptoms that are attributable to a heart rate that is too low or to breaks in heart rate (“bradycardia”). Such symptoms can include dizziness or fainting, shortness of breath or reduced physical performance. The pacemaker itself is usually implanted underneath the collarbone above the pectoral muscle. From there – depending on the nature of the arrhythmia – one or two thin probes (“electrodes”) run to the heart, and these register the natural heartbeat precisely. When necessary, the electrodes can dispense control impulses discreetly to your myocardium. Pacemakers are customised precisely to the patient’s specific needs and do not impair their quality of life. On the contrary – whoever needs a pacemaker will live a better and safer life with one! We want you to be fully informed, so please contact us with any questions that you may have on pacemaker therapy or pacemaker check-ups! Defibrillator implants are the most effective protection against sudden cardiac death. It detects life-threatening states of arrhythmia in just a few seconds and is able to treat these quickly and effectively. In recent decades, the “defi” has saved the lives of countless people – some of them even several times. For patients with a life-threatening arrhythmia disorder that is already known and the cause of which cannot be treated, ICD therapy is the treatment of choice. For patients deemed at high risk of such arrhythmia disorders, a decision must be made whether to implant such a device by way of precaution. The ICD is usually implanted underneath the collarbone around the pectoral muscle. From there, one or two thin probes (“electrodes”) run to the heart, and these register the natural heartbeat precisely. These electrodes enable the device to immediately detect and treat arrhythmia disorders. In addition to the treatment of acutely life-threatening disorders, normal pacemaker functions can also be performed if necessary. Defibrillators must be adapted precisely to the specific needs of the patient. They do not impair your quality of life. On the contrary – whoever needs a defibrillator will live a better and safer life with one! We want you to be fully informed, so please contact us with any questions that you may have on defibrillator therapy or defibrillator check-ups. It is not uncommon in patients with heart failure for the myocardium to work with poor coordination. There are delays and inconsistencies in the electrical stimulation and in the ability of the heart to pump blood. This affects the left ventricle in particular, meaning that the heart is additionally weakened. CRT devices („Cardiac Resynchronisation Therapy) try to balance out these delays and improve the heart’s pumping function. At present, an additional pacemaker probe (“electrode”) has been successfully placed in almost all affected patients in such a way that enables the left ventricle to be selectively controlled. 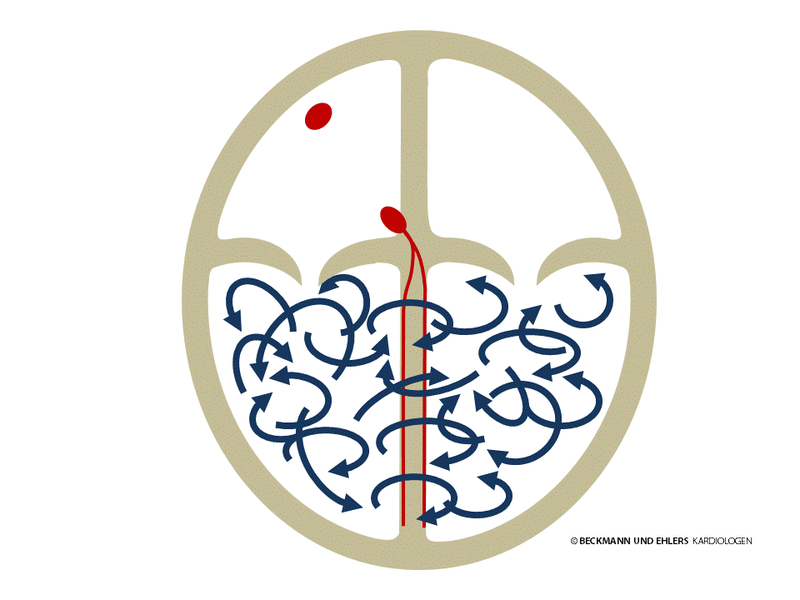 The devices are then fine-tuned to coordinate and optimise the stimulation sequence in the ventricles. Whether resynchronisation therapy is performed using only a pacemaker or with a pacemaker-defibrillator combination is in part dependent on whether there is also a risk of a life-threatening arrhythmia. We will discuss all aspects of this decision with you in depth. CRT implants must be adapted precisely to the specific needs of the patient, as this is the only way that they can contribute to the patient’s performance and quality of life. We want you to be fully informed, so please contact us with any questions that you may have on CRT therapy or device check-ups. Personal contact is important to us. Are you looking for the phone number and address? Information to contact the individual practices directly can be found here. Es liegt keine USt-ID nach §27a UStG vor. Die Inhalte dieser Webseite wurden mit größter Sorgfalt erstellt und geprüft. Für die Richtigkeit, Vollständigkeit und Aktualität der Inhalte können wir jedoch keine Gewähr übernehmen. Der Betreiber ist ausschließlich für die eigenen Inhalte auf diesen Seiten nach den allgemeinen Gesetzen verantwortlich. Diensteanbieter sind nicht verpflichtet, die von ihnen übermittelten oder gespeicherten fremden Informationen zu überwachen oder nach Umständen zu forschen, die auf eine rechtswidrige Tätigkeit hinweisen. Verpflichtungen zur Entfernung oder Sperrung der Nutzung von Informationen nach den allgemeinen Gesetzen bleiben hiervon unberührt. Eine diesbezügliche Haftung ist jedoch erst ab dem Zeitpunkt der Kenntnis einer konkreten Rechtsverletzung möglich. Bei bekannt werden von entsprechenden Rechtsverletzungen werden wir diese Inhalte umgehend entfernen. Unsere Webseite enthält Links zu Webseiten Dritter, auf deren Gestaltung und Inhalte wir keinen Einfluß haben. Deshalb können wir für diese fremden Inhalte auch keine Gewähr übernehmen. Für die Gestaltung und Inhalte der gelinkten Seiten ist stets der jeweilige Anbieter oder Betreiber der Seiten verantwortlich. Rechtswidrige Inhalte der verlinkten Seiten waren zum Zeitpunkt der Verlinkung nicht erkennbar. Eine permanente inhaltliche Kontrolle der verlinkten Seiten ist jedoch ohne konkrete Anhaltspunkte für eine Rechtsverletzung nicht zumutbar. Bei bekannt werden von Rechtsverletzungen werden wir die betreffenden Links umgehend entfernen. Diese Seite kann ohne das Wissen der Betreiber von einer anderen Seite angelinkt worden sein. Die Betreiber übernehmen keine Verantwortung für Darstellung, Inhalt oder irgendeine Verbindung zu den Betreibern in Webseiten Dritter. Die Betreiber der Seite sind bemüht, stets die Urheberrechte anderer zu beachten und auf selbst erstellte oder lizenzfreie Quellen zurückzugreifen. Die durch den Seitenbetreiber erstellten Inhalte auf dieser Seite unterliegen dem deutschen Urheberrecht. Beiträge Dritter sind als solche gekennzeichnet. Die Vervielfältigung, Bearbeitung, Verbreitung und jede Art der Verwendung außerhalb der Grenzen des Urheberrechts bedürfen der schriftlichen Zustimmung des Autors bzw. Erstellers.Jede Bearbeitung, Verfielfältigung, Verbreitung oder öffentliche Wiedergabe ohne diese Zustimmung stellt einen Urheberrechtsverstoß dar, der strafrechtlich verfolgt wird. Downloads und Kopien von Inhalten dieser Seite sind nur für den privaten, nicht aber für den kommerziellen Gebrauch gestattet. Soweit auf dieser Seite personenbezogene Daten erhoben werden (z.B. Name oder eMail-Adresse), erfolgt dies auf freiwilliger Basis. Der Nutzung von im Rahmen der Impressumspflicht veröffentlichten Kontaktdaten durch Dritte zur Übersendung von nicht ausdrücklich angeforderter Werbung und Informationsmaterialien wird hiermit ausdrücklich widersprochen. Der Betreiber der Seite behält sich rechtliche Schritte im Falle einer unverlangten Zusendung von Werbung und Informationen, auch durch sogenannte Spam-eMails, vor. No VAT ID no. pursuant to 27a UStG (German Value Added Tax Act). We have taken the greatest possible care over compiling and checking the content on this website. However, we cannot guarantee that content is correct, complete and up to date. The operator is responsible exclusively for its own content on these pages in accordance with the applicable general laws. Service providers are not obliged to monitor transmitted or saved third-party information or to investigate circumstances which indicate illegal activities. This does not affect obligations in respect of removing or blocking the usage of information in accordance with the general laws. However, any liability in this regard only applies as of the time when a definite violation of the law comes to our knowledge. We will remove the respective content without delay once we gain knowledge of such violation. Our website contains links to websites of third parties, the design and content of which are beyond our control. Accordingly, we are not liable for such third-party content. The design and content of linked websites are in every case the responsibility of the respective supplier or operator of the sites. No illegal content were apparent on the linked websites at the time of linking. However, in the absence of any specific indication of illegal activities, permanent monitoring of the contents of linked websites is not reasonably practicable. We will remove the respective links without delay once we gain knowledge of such violation. This website may have been linked by another site without the knowledge of the operators. The operators do not accept liability for the representation and content of or connection of any other kind to the operators of websites of third parties. The website operators endeavour to respect the copyright of others at all times and to use only content created by the operators themselves or open source contents. The content created by the website operators on these pages is subject to German copyright. Content of third parties is designated as such. Any duplication, adaptation, dissemination and any kind of use outside the limitations of copyright require written authorisation by the author and/or creator. Any adaptation, duplication, dissemination or public representation without authorisation constitutes a breach of copyright which will be pursued under criminal law. Downloads and copies of content from these pages are only permitted for private use but not for any commercial use. Where personal data are collected on this website (e.g. name or email address) this is done on a voluntary basis. We herewith expressly object to the use by third parties of contact data published in the context of the mandatory legal notice for the purposes of sending advertising and information which has not been expressly requested. The operator of this website reserves the right to take legal action in the event of any unsolicited sending of advertising and information, including by way of spam emails. The data processing on this website is carried out by the website operator. You can find its contact details in the legal notice of this website. Firstly, there is the data you send to us. This can be, for example, data that you enter in a contact form. Other data is collected automatically by our IT system when you visit our website. This is mainly technical data (for example, internet browser, operating system or time of the page request). The collection of this data is automatic as soon as you access our website. Some of the data is collected in order to ensure the correct provision of the website. Other data can be used to analyse your user behaviour. At any time, you have the right to obtain free information about the origin, recipient and purpose of the personal data we have about you. You also have a right to request the correction, blocking or deletion of this data. For this purpose and for further questions about data protection, you can contact us at any time at the address given in the legal notice. Furthermore, you have a right of appeal to the supervisory authorities. Please note that data transmission over the internet (for example, when communicating via email) may have security vulnerabilities. It is impossible to completely protect the data from third-party access. The controller is the natural or legal person who, alone or in concert with others, decides on the purposes and means of processing personal data (such as names, email addresses, etc.). Many data processing operations are only possible with your express consent. You can revoke consent at any time. You can do this by simply emailing us. The legality of the data processing carried out prior to the revocation remains unaffected by the revocation. In the case of violations of data protection law, the data subject has the right of appeal to the supervisory authorities. The supervisory authority for data protection issues is the federal-state data protection officer of the Germany federal state in which our company is based. A list of data protection officers and their contact details can be found in the following link (in German only): https://www.bfdi.bund.de/DE/Infothek/Anschriften_Links/anschriften_links-node.html. You have the right have data that we process on the basis of your consent or in fulfilment of a contract sent to you or a third party in a standard, machine-readable format. If you require the direct transfer of data to another data controller, we will only do this if it is technically feasible. This page uses SSL or TLS encryption for security reasons and to protect the transmission of sensitive content, such as orders or inquiries that you send to us, the website operator. TLS-Verschlüsselung. You can recognise an encrypted connection when the address bar of the browser changes from “http://” to “https://” and the lock symbol appears in your browser bar. If SSL or TLS encryption is enabled, the data that you transmit to us cannot be read by third parties. We herewith expressly object to the use of contact data published in the context of the mandatory legal notice for the purposes of sending unsolicited advertising and information. The operators of the pages expressly reserve the right to take legal action in the event of the unsolicited sending of advertising information, for example spam emails. This data is not combined with other data sources. The legal basis for the data processing is Art. 6 (1) lit. b) GDPR, which allows the processing of data to fulfil a contract or for pre-contractual activities. If you send us enquiries using the contact form, the information you provide in the enquiry form, including your contact details, will be stored by us for the purpose of processing the enquiry and in case of follow-up questions. We will not pass on this data without your consent. The processing of the data entered into the contact form is therefore exclusively based on your consent (Art. 6 (1) lit. a) GDPR). You can revoke this consent at any time. You can do this by simply emailing us. The legality of the data processing carried out prior to the revocation remains unaffected by the revocation. The information you provide in the contact form will remain with us until you ask us to delete it, revoke your consent to storage, or the purpose for data storage is no longer current (for example, after your inquiry has been processed). Mandatory statutory provisions – especially retention periods – remain unaffected. This site uses Web Fonts, provided by Google, to ensure that fonts are displayed uniformly. When you call up a page, your browser loads the required web fonts in your browser cache to display texts and fonts correctly. For this purpose, the browser you are using must connect to Google’s servers. As a result, Google learns that our website has been accessed via your IP address. The use of Google Web Fonts is in the interest of a consistent and attractive presentation of our online services. This is a legitimate interest per Art. 6 (1) lit. f) GDPR. This page uses Google Maps via an API. The provider is Google Inc., 1600 Amphitheater Parkway, Mountain View, CA 94043, USA. To use the features of Google Maps, it is necessary to store your IP address. This information is usually transferred to a Google server in the United States and stored there. The provider of this page has no influence on this data transfer. Google Maps is used to improve the appearance of the website and so that it is easy to find the locations mentioned on the site. This is a legitimate interest per Art. 6 (1) lit. f) GDPR.